Jeremy, a birder from Skagway who has been in town the last few days, wanted to get out and look for birds. He had e-mailed both Kitty LaBounty and myself about going out to look for birds, and we decided it would be nice to go out in Kitty’s skiff to look for puffins and auklets. I was hoping to get better pictures than I had been able to before, and Jeremy had not seen Horned Puffins before. We headed out after Kitty’s class this afternoon. We first headed out toward the lighthouse to look around then, over to the channel. After taking a little longer than usual to get through the channel, on account of giving a tow to another boat that had lost power, we went out toward the Apple Island looking at birds before heading back to town. Weather: The weather was quite nice today. Although overcast skies prevailed by this evening, the sun was shining for a good portion of the day and winds were calm. Temperatures were cool, but not frigid. However, I must say that standing in a relatively open skiff for an hour or two resulted in very cold hands and feet. Birds: We saw a couple of birds that were fairly mysterious, though once I got home and was able to look at a field guide and the pictures I took, I think they were not too hard to figure out. The first bird was a strange brownish duck with a funny shaped beak. We were not able to get too close to it and there was enough wave action that the viewing from a distance was challenging. After looking at the pictures and the field guide, I’m pretty sure that it was a first-year Black Scoter. It’s beak was starting to turn yellow, but it still had the very brown plumage of a young bird. If Sibley’s drawing of a February first-year bird is a reliable guide, this particular bird is hanging on to its brown plumage a lot longer than would be expected. There were lots of gulls in the channel again. I did not try to figure out the relative proportions of each, however. There were, once again, Black-legged Kittiwakes. 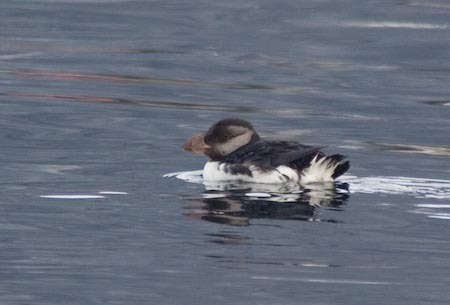 A pair of Horned Puffins were right where I had seen them yesterday at the north end of the channel. They tolerated our approach pretty well. They’re probably getting used to boat traffic if they have been hanging out there for awhile. They did swim away from us a little bit, but seemed mostly unconcerned. Out past the breakwater we saw Long-tailed Ducks and many White-winged Scoters. I find it interesting that there are so many White-winged Scoters not far out, but also not easily viewed from the shore. The second mystery bird was a smallish black alcid that flashed white when it dove. I did not remember that Rhinocerous Auklets had white under parts, and the bird kept diving and/or swimming away from us, never allowing for a very close approach, so we couldn’t figure out what it was. Once I was able to look in the book when I got home, it became clear that the bird was a Rhinocerous Auklet.